Look guys, I drew a guy! An actual guy! Hot on the heels of my relative success with cute little Jean Grey, I tried to draw a cute little Gambit; he did not come out anywhere near as cute. That said, at least this sketch has some personality. 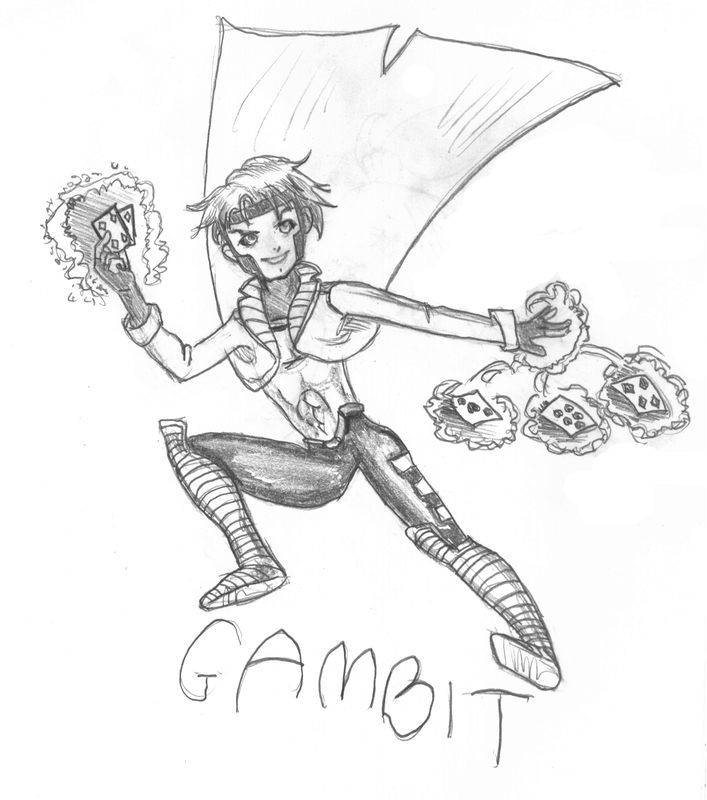 I’ve always thought the idea behind Gambit’s card-throwing gimmick is really clever, because it gives you lots of stuff to draw–with all the cards flying everywhere with their trails of glowing energy and whatnot. He’s a character who’s just really suited to the medium he was created in, which may be a reason why he’s been mostly ignored by the movies. This definitely looks a little off-kilter though…I think I just need more practice drawing guys. And cartoony things. And everything. I really like drawing X-Men fanart though, so I’ll probably do more of it– who knows, give me enough time and I may have a downright X-Men doujin going on here.